I'm a huge salad fan and love adding different textures and ingredients beyond lettuce and tomato. At the Good Food Festival in Chicago this past spring, I was introduced to Honestly Cranberry. I sampled some at the vendor table where they emphasized that they are all natural with no added sugars, juices or oils. I had really never given any consideration to added ingredients in cranberries. It was a label that I had never bothered to read, but once I went back home and took a look I was really surprised to see that there were 26 grams of stages and 33 grams of carbs in a 1/4 cup serving in the brand I had been using to supplement my salads. In sampling it on its own, it was more tart than what I'd been used to, so I was anxious to try it in a salad and see how it blended in with other ingredients. The folks at Honestly Cranberry were nice enough to send along a full package for me to use at home. My first concoction was this salad of spinach, yellow and red peppers, cucumbers, goat cheese crumbles and cranberries with a maple vinaigrette. Once combined with all these other veggies and lightly tossed with the dressing, the tartness was much less noticeable. 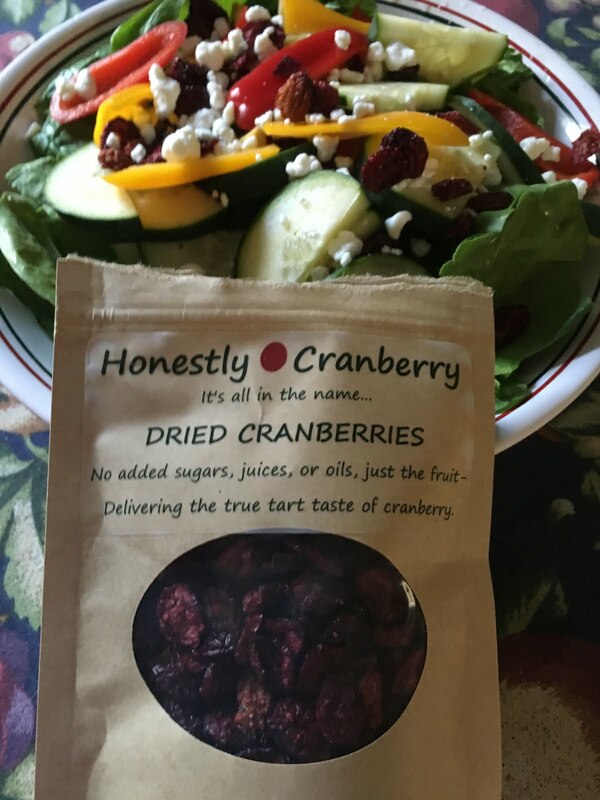 The chewy texture was a nice addition to the salad and now that I know better when it comes to all the artificial stuff that normally go into dried cranberries, I probably should order some more. This Wisconsin product is available online at www.honestlycranberry.com.